Mark London from Mad Cave Studios has created another cool series for the upstart publisher and this one really looks awesome. Honor and Curse takes place in a medieval Japan setting where a Shinobi finds that he is cursed by a demon. That alone is a cool premise for a comic but Mad Cave has also excuted this well with writing from Mark London and awesome artwork from Nicolas Salamanca. Honor and Curse takes place in Feudal Japan and follows Genshi Sakagura, adopted by the Iga clan after witnessing the murder of his parents. A promising young shinobi, Genshi hopes to marry Lord Haruki’s beautiful daughter, Akemi, and lead the Iga clan warriors into battle. His future looked promising, until a training session turned violent and Genshi almost killed Master Nishiro. From that moment forward, Genshi is tormented by an evil spirit, known as a Tengu, that haunts his dreams and bends reality around him. But nothing can prepare Genshi for when the Tengu consumes him and he becomes an unstoppable force of nature with no recollection or remorse for his actions. Witness the struggle of a young man coming to grips with his fate and realizing that is both and Honor and Curse. One of the coolest world building comics is the Mad Cave comic Battle Cats. Mad Cave Studios always does a great job at promoting their comics including making awesome trailers like this one. Rival clans, a forbidden love, and a tormented soul. 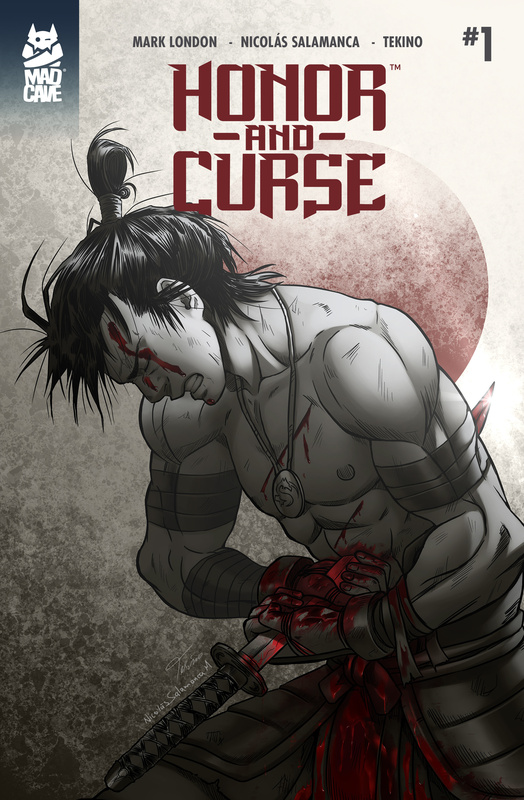 Mad Cave Studios is very proud to announce the all-new, supernatural inspired, shinobi thriller, Honor and Curse. From the creative team of Mark London (Battlecats, Midnight Task Force, Knights of The Golden Sun) and the talented duo of Nicolás Salamanca and Tekino. This comic is for fans of epic storytelling, gorgeously illustrated art and over-the-top action. Honor and Curse is the classic tale of a man coming to terms with who he is and what he will become. Honor and Curse takes place in Feudal Japan during the Edo period and the story follows Genshi Sakagura. As a young boy, Genshi was adopted by the Iga clan after witnessing the murder of his parents. Now, Genshi is a promising young shinobi with dreams of marrying Lord Haruki’s beautiful daughter, Akemi, and leading the Iga clan warriors into battle. 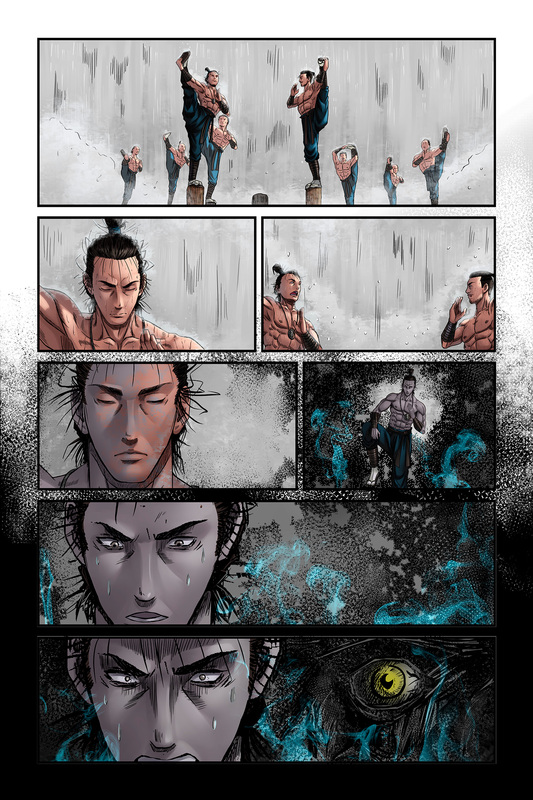 Genshi’s future was promising, until a training session turned violent and he almost killed Master Nishiro. From that moment forward, Genshi is tormented by an evil spirit, that haunts his dreams and bends reality around him. But nothing can prepare Genshi for when the Tengu consumes him and he transforms into an unstoppable force of nature. As a result of his transformation, Genshi loses all recollection or remorse for his actions.